We are experienced professionals specializing in home improvement. We are proud of our quality work. Our mission is to meet the home improvement needs of people in the Washington metropolitan area by offering great quality services and customer satisfaction at a competitive price. © 2003 Twin Star Painting All rights are reserved. 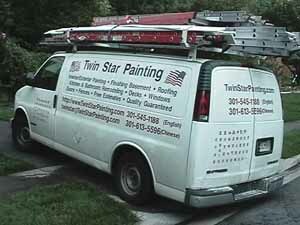 All the photographs and other materials are the property of Twin Star Painting. Any use of these photoes without the express written permission from Twin Star Painting is strictly prohibited!